Elastics Game Owl is a traditional game which you may remember playing at school. This little set comes with a multicoloured loop of elastic which will stretch to 2m long. It can all be packed away onto a holder which has a owl perched on the top. Two children stand inside the loop so they are stretching the elastic taut around their ankles. A third person performs a series of hops and jumps maybe with a rhyme. When finished, the height of the elastic is raised to knees, then thighs, then waist. The players have decided what order the jumps and hops have to happen in and if you need your feet to land inside or outside or even on top of the elastic. If the current player fails to manage the correct jump their turn is over and play passes to one of the people inside the circle of elastic, who then tries to do better than the previous player. Size: Holder is 14cm long. Loop of elastic stretches to about 2 meters. 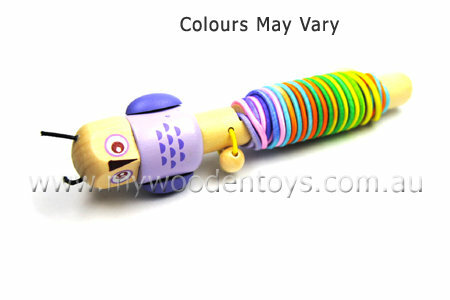 Material: Wood childsafe paint, elastic. We like this because: "A game of my childhood. " Thank you so much for a very efficient service. All my selected toys arrived, after only a few days from when ordered, in perfect condition and quality. I would highly recommend your business to my friends.